The birth of modern cosmology came about when Edwin Hubble discovered the expansion of the Universe through his observations of receding galaxies. By plotting recession velocity against distance, one can see that there is a simple linear relationship between the two. Hubble’s law, and its associated Hubble constant H0, is now a standard way of quantifying the rate of expansion of the Universe. Hubble’s original plot of recessional velocity vs. distance, taken from his landmark 1929 paper. Despite its apparent simplicity, a considerable amount of effort has been devoted to measuring H0 accurately. The challenge in determining H0 comes from the difficulty in accurately measuring large distances in the Universe and controlling for systematic errors. 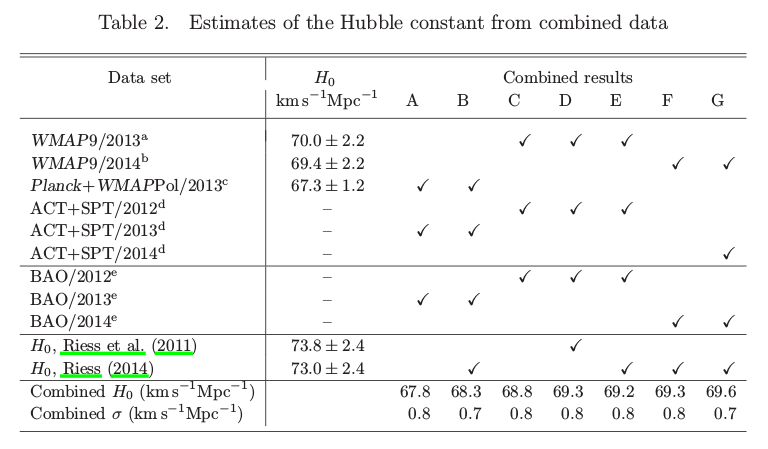 Early measurements of the Hubble constant ranged from 50-100 km/s/Mpc. The Hubble Space Telescope provided data that yields a value of H0 = 72 km/s/Mpc. New results have constrained H0 to percent accuracy, but different approaches to measuring H0 probe different epochs in cosmic history. These differences in the measured values of H0 may suggest additions or modifications to the standard cosmological model, or they could be caused by systematic errors. In this paper, the authors consider three independent methods for measuring H0 and their mutual consistency. These methods are outlined as follows. To determine H0 using Hubble’s law, one needs a reliable method for determining distances to extragalactic objects. One method of doing this is by using Type Ia supernovae. Since these explosive events all have roughly the same luminosity (and are thus excellent standard candles), Type Ia SNe are commonly used to measure extragalactic distances. This method of determining distances still relies on accurate calibrations of their luminosities, which rely on cross-checking distances using parallax, Cepheid variables, etc. Baryon acoustic oscillations (BAO) are visible density fluctuations in the distribution of galaxies in the Universe. These large scale fluctuations represent oscillations that formed in the early Universe when matter and radiation were combined into a single baryon-photon fluid. Specifically, there is a characteristic length scale that represents the distance a sound wave could travel in this fluid. BAO measurements are useful for measuring relative distances as a function of redshift. By examining the angular and radial extents of these oscillations, one can probe the Hubble constant at different epochs of cosmic history (i.e. the Hubble parameter, which changes with redshift). Another indirect method of measuring H0 is by examining the pattern of CMB anisotropies across the sky. More specifically, the CMB power spectrum can be used to extract the expansion history of the Universe. These measurements are obtained from the WMAP mission, and are combined with smaller scale measurements from ground-based experiments such as the South Pole Telescope and the Atacama Cosmology Telescope. An analysis of the CMB data from the Planck mission gives a slightly different and lower value for H0, but this is because there are different assumptions being made in the cosmological models between the two data sets (e.g. differing neutrino masses and helium fraction). By combining previously reported values of H0 from these three methods, the authors compute weighted averages from these data sets to find the best value of H0. The authors also find that these different values are consistent with each other and do not represent any significant difference. The combined results give H0 = 69.6 km/s/Mpc, and suggest that there is no new physics required to explain any seemingly different values across the different measurement methods. The values of the H0 derived from different measurement techniques and data sets. The columns (A-G) represent different weightings of these data, and column G represents the best estimate concordance value. The mutual consistency of H0 across these measurement techniques seems to indicate that the standard LCDM cosmological model is not in jeopardy. Future release of Planck data will provide updated values for H0, but the combined results are unlikely to change significantly. Future measurements of H0 using data from SDSS, GAIA, etc. will give us further constraints on the Hubble constant and provide further insight into our methods of determining cosmological parameters. I am a graduate student at UCLA, where I am working with Steve Furlanetto on models of galaxy clustering and their applications to the reionization era. My main interests involve high redshift cosmology, dark matter, and structure formation. Previously, I was an undergraduate at Caltech, where I did my BS in astrophysics. When I'm not doing astronomy, I enjoy engaging in some linear combination of swimming/biking/running.